Only 17 days till Christmas!! Is it just me, or, does it seem like Christmas is coming faster this year? Or, maybe the days are just going by so much quicker? We have our vintage tinsel tree up, yay!! We hung a wreath on the front door (same wreath I had custom made for my Pinup photoshoot that I love so much). I spent last weekend making mama Greco’s beloved scramble… a real 1950s/1960s party mix that has different cereals, nuts, pretzels and spices and it bakes in the oven for several hours needing a careful stir every 15 mins so it does not burn and being careful not to crush or break the ingredients. It is a lot of work but totally worth it with when it comes out of the oven browned and toasted with those warm melt-in-your-mouth nuts and, it really kicks off our holidays. Mama Greco went to be with the lord last December so we are really missing her and the special spirit she had, especially this time of year, she really loved Christmas and was such a generous, giving, and loving person. We love you and miss you so very much Mama Greco!! 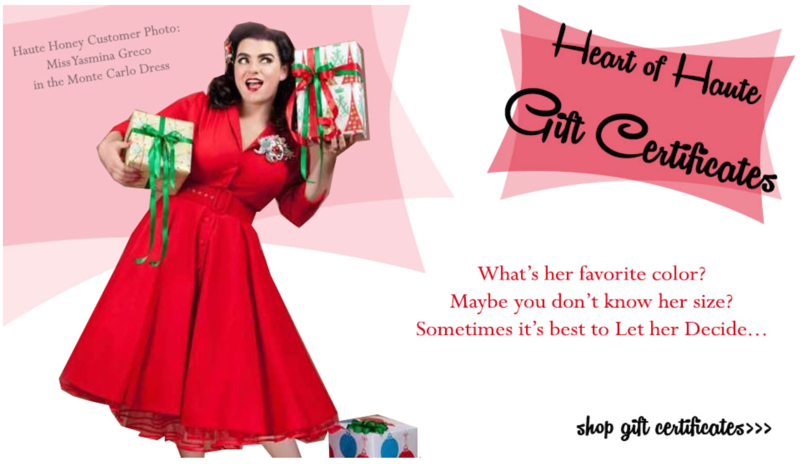 I am so thrilled to be representing the vintage inspired fashion brand Heart of Haute this holiday season. 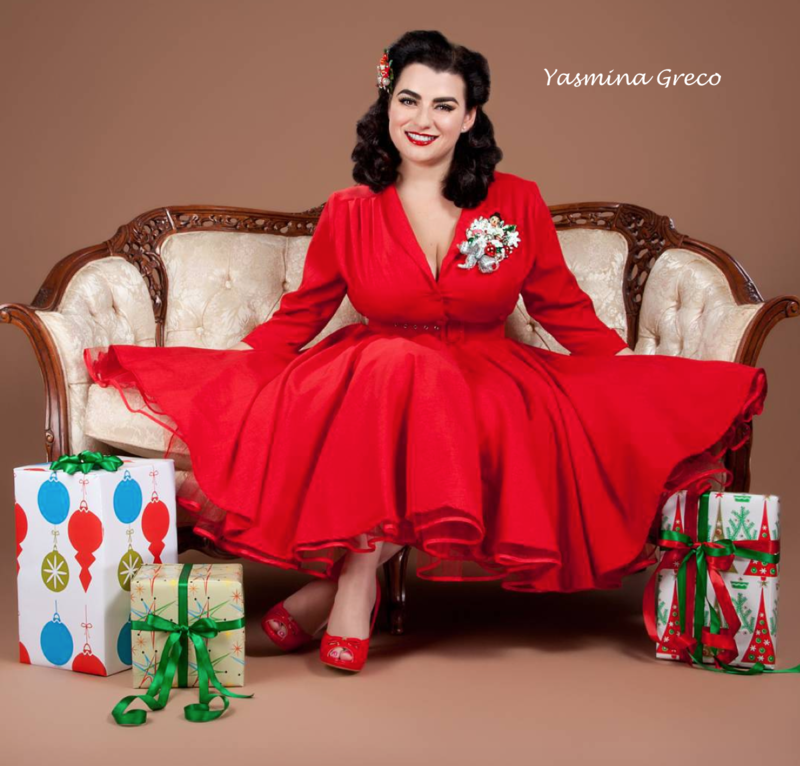 I am wearing Heart of Haute’s red ‘Monte Carlo’ dress and it is so perfect for a vintage holiday with its beautiful full circle skirt and it is very accommodating to us curvy voluptuous ladies with large busts. Heart of Haute is one of my personal favorite brands, their quality, designs, and fit are appropriate yet feminine enough to wear to work, stand-out stylish for weekends and special occasions too. All the clothing is made in the USA…. how fantastic is that!! If you are not familiar with Heart of Haute spend a little time browsing their website and I am sure you will find beautiful dresses, skirts, tops and sweaters that you will need in your wardrobe and these will become wardrobe staples. If you are already a devoted Heart of Haute customer or shall we say #HauteHoney, then you understand exactly what I am saying. If your sweetie is creatively trying to find out what you want this Christmas, let them know a Heart of Haute gift card would be greatly appreciated!! Hope your days leading up to Christmas are full of laughter, joy and cheer! !